Thanks to everyone who commented about their favorite tools! We sure do love our scrapbooking gadgets, don't we!? I found several mentioned that are high on my favorites list also and a few others that I decided I'll have to add to my wish list! 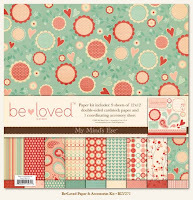 Everyone who commented was entered for a chance to win the Be Loved collection by My Mind's Eye. So, without further delay, Random.org felt that commentor #17 should be the lucky winner this time around. Congratulations, Jennifer!! Watch your email inbox for further details on how to claim your prize! Don't miss out on a chance to win in some other great giveaways coming soon! Sign up for updates to the AMOM blog by email subscription or your favorite blog reader through the links in the left sidebar.